We’d love your help. 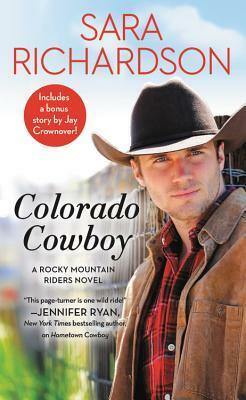 Let us know what’s wrong with this preview of Colorado Cowboy by Sara Richardson. As a champion barrel racer, Charity Stone has learned to hold her own in the male-dominated rodeo world. There's no cowboy she can't handle...except for one. Officer Dev Jenkins has made it clear he doesn't look at her like one Come home to Topaz Falls, Colorado where a down-on-her-luck bull rider falls for the cowboy she can't resist in this heart-warming western romance! To ask other readers questions about Colorado Cowboy, please sign up. Charity has escaped from the scars of her childhood by fully focusing on become the best barrel rider around. She has no room in her life for men or asking anyone for help... Until her sister, who she hasn't seen in 10 years shows up on her door with her 13yr old nephew. Her sister skips out in the middle of the night leaving Charity with a belligerent and scared young teen. A local officer of the law, Dev, who has the hots for Charity, offers to help her with finding her sister and spending time Charity has escaped from the scars of her childhood by fully focusing on become the best barrel rider around. She has no room in her life for men or asking anyone for help... Until her sister, who she hasn't seen in 10 years shows up on her door with her 13yr old nephew. Her sister skips out in the middle of the night leaving Charity with a belligerent and scared young teen. A local officer of the law, Dev, who has the hots for Charity, offers to help her with finding her sister and spending time with her nephew. Connecting emotionally with her readers, Richardson pens a tale that will warm you heart. Her characters are engaging and genuine with true flaws and difficult life circumstances that draw you deeper into her storytelling. I received this ARC copy of Colorado Cowboy from Forever (Grand Central Publishing). This is my honest and voluntary review. Colorado Cowboy is set for publication April 2, 2019. When she came to Topaz Falls two years ago, barrel racer Charity Stone didn't know that she would become a small town gal. She have her colleague from the rodeo circuit and she made friends, but she still kept to herself the details about her past and is hard to approach for men. Police officer Dev Jenkins have been attracted to her since the beginning but he knew right away that to get a chance with her, he had to give her time and let her set the pace. It's not something they discussed nor ackn When she came to Topaz Falls two years ago, barrel racer Charity Stone didn't know that she would become a small town gal. She have her colleague from the rodeo circuit and she made friends, but she still kept to herself the details about her past and is hard to approach for men. Police officer Dev Jenkins have been attracted to her since the beginning but he knew right away that to get a chance with her, he had to give her time and let her set the pace. It's not something they discussed nor acknowledged but they both felt the chemistry and that's why Charity kept her distance and avoid his eyes. He's different from the other men because he makes her feel something. But when the sister she haven't seen in ten years come up on her doorstep with her son and run away the next day and Charity end up having to take care of her nephew for an undeterminate time, Charity will have to put down her shield and ask Dev for his help with the reckless behavior of her thirteen-year old nephew. And maybe it'll give her a chance to reconciliate with her past. I don't know what to tell you to convince you to give this series a try, but I can tell you this one was my favorite. The MC's stories both talked to me, even if I lived neither. The chemistry between Dev and Charity was natural and beautiful and the way the romance evolved was stimulating and sweet. There was an awareness between then and I adore this kind of tension, when you feel like there's an electric wire between two person. What charmed me (and probably Charity too) the most about the hero was his disarming honesty. His patience, the way he listen to people and his perceptiveness make him a book boyfriend. Is it because I totally understand the heroine need to protect herself in keeping her distance that I found her so lovable? I don't know but what I know is that Colorado Cowboy is a memorable book and after the ninth or tenth book that I read by this author, it was my favorite so far. This was entertaining, but there were a lot of things in the book that didn't add up. Since its fiction you can pass it off, but somethings were questionable. Like how did Charity have money. She was a barrel racer, but is that enough to come from nothing and have enough to purchase a house, a truck, a horse, probably a horse trailer and keep the horse fed? I don't know. Anyway.. This is my first Sara Richardson book (I have another of hers on my tbr). This was heavy packed with emotions about family drama and suddenly Charity the main character has to raise her troublesome 13 year old nephew left by her sister who is on the bad end of the law. I wasn't prepared how this story was going to turn out (being the kind it was), but overall it was good. Colorado Cowboy will punch you right in the feels! Charity had a rough childhood and it has made her a hardened adult who is NOT looking for love. Dev is the local sheriff who has carried a torch for Charity, but even he has some past hurt. As if these two aren't enough to get your feels feeling, add in Charity's nephew who is abandoned by his mom (Charity's sister) and in some legal trouble.As a teacher, my heart went out to Brodie. I have seen students like him before: tough on the outside bec Colorado Cowboy will punch you right in the feels! Charity had a rough childhood and it has made her a hardened adult who is NOT looking for love. Dev is the local sheriff who has carried a torch for Charity, but even he has some past hurt. As if these two aren't enough to get your feels feeling, add in Charity's nephew who is abandoned by his mom (Charity's sister) and in some legal trouble.As a teacher, my heart went out to Brodie. I have seen students like him before: tough on the outside because they are guarding their extra wounded undersides. You can also see why Charity has such a rough exterior as well and again, my heart went out to her. I appreciated that the bond between Dev and Charity was on the slower burn side. Its like trying to approach a skittish horse-if you move to fast, they spook! I was so excited when the publisher contacted me to review this book, as I very much enjoyed the book that came before this in the series. I think I loved this book even more! This story was so much more than just the romance between Charity and Dev, it was the relationship between Charity and her nephew Brodie, her sister and her mother and the things that make a group of people a family. This was a slow burn romance and there was some steaminess too it, it wasn't too over the top. Just when I think I can’t enjoy this series more or Sara Richardson has dug as deeply into emotions as is humanly possible along comes COLORADO COWBOY and I’m amazed all over again. Part of what fascinated me in this romance is that Dev and Charity came from similar backgrounds, not exactly the same but close – and they each emerged with a different outlook on life. What makes the difference? The situation, the people around to help or not help, personality? I don’t have the answer but it did have me wondering as their romance fell into place what Charity’s life would have been like if she’d had a different outlook on life and people. As a rodeo barrel racer Charity thrives in a male-driven profession. She’s accustomed to holding her own and being one of the guys. When her sister and nephew show up out of the blue Charity’s life is about to go into a tailspin… especially when her sister takes off in the middle of the night leaving behind one angry, confused and scared teenager who already has shown he’s capable of getting himself into some serious trouble. Dev has been interested in Charity since she moved into town… and she’s equally shot him down every single time. He’s not about to give up and her sudden change in circumstances just might work in his favor. And while Dev would never take advantage of a woman, he’s not above using a chance to show her that he’s trustworthy when it drops into his lap. What also drops is a young teen who is troubled enough to cause harm and put Dev’s hometown in some danger from his actions. How in the world is Dev going to convince Charity that he’s the man for her when he has to deal with the legal troubles her nephew is getting himself into… very carefully. Dev, Charity, and Brodie – three people with much in common and many lessons yet to be learned. Somehow Dev has to bring them all together into a family because he’s not leaving Charity or Brodie behind. COLORADO COWBOY is full of emotions, strong ties to the past that need cut and healed, old wounds that need to be lanced and heal over before moving on to a better future. Every time I start a Sara Richardson story I know my heart’s going to break at some point, and it did but I loved the way these three people eventually bond together as they learn to trust each other and themselves. It’s not a quick, easy journey but it certainly is a worthwhile one. If you enjoy going deeper below the surface of characters, discovering what makes them do what they do and you love watching two people finally acknowledge that they want a life together no matter the difficulties involved… then you’re going to love this story and this series. I would not hesitate to recommend this story to any Romance reader who loves a good solid romance with believable characters facing events that could easily happen in anyone’s life. Charity and Dev are two of the most fragile people on the inside with the toughest exteriors. They are both wonderful humans who care deeply, sometimes too deeply. While their early childhoods are very similar, the rest of their growing up years are drastically different and it shows. Dev has at least learned to trust others. He still has a fear of abandonment, but he knows enough to know to love and lose is better than never having love. Charity still has these lessons to learn. As well as Dev and Charity making my heart ache, we have Charity’s nephew Bodie who is like a wounded animal. Bodie needs a lot of love and wants a lot of love and tenderness, but he trusts nothing and nobody and will lash out without provocation. Charity understands this young man on such a deep level and it wounds her soul to feel like she’s not able to help him. This is truly a beautiful story of three people finding some deep heeling, love, and stability. I had to double and triple check the page count because I sure didn’t feel like this was an over 400 page book! It flew by and I didn’t want to put it down. This author really amazes me with the chemistry and heart that she writes into her stories. Oh, I fell in love with Charity, Dev, and Brodie. I was right there with their pain, fear, and hope. I know this book is Charity and Dev working on a relationship, but Brodie becomes part of it even if he is just a kid. This has real issues in it that people must work through. Sara did a get job with that. Charity Stone is a champion barrel racer. She spends almost all her time with men, and she can hold her own with them. That is until Office Dev Jenkins comes into the picture. He treats Charity Oh, I fell in love with Charity, Dev, and Brodie. I was right there with their pain, fear, and hope. I know this book is Charity and Dev working on a relationship, but Brodie becomes part of it even if he is just a kid. This has real issues in it that people must work through. Sara did a get job with that. Charity Stone is a champion barrel racer. She spends almost all her time with men, and she can hold her own with them. That is until Office Dev Jenkins comes into the picture. He treats Charity as a woman and not one of the boys and she is not sure how to handle that. One day her sister shows up and leaves her 13-year-old nephew Brodie with her and doesn’t say why. Now Charity’s life is turned upside down. Charity has always taken care of herself and never asked for help from anyone. That will not work anymore. Dev has wanted Charity since he first meets her after she move to Topaz Falls. She has always pushed him away and he doesn’t know why, but he keeps on trying. Now that her nephew is here, she is asking for his help. He is going to use this to make his move and start a relationship with her. When Brodie makes some mistakes that Dev can’t overlook because of his job it puts tension between him and Charity. Dev is trying to do his job without loosing Charity. Is that even possible? Can Charity learn to trust and is Dev someone she should? * ARC provided by NetGalley and the Publisher for an honest review. Charity if a barrel racer and shes more then surprised to see her sister at her door after her sister making it clear she didn't want her in her and her sons life. On top of that she up and disappears and leaved her nephew in her care. Worried about her sister she asked Deputy Dev to track her sister down. I really enjoyed this book. It was interesting getting to know Charity and her sisters backstory. It really set the tone of who her sister is, and why things happens the way things went down. H Charity if a barrel racer and shes more then surprised to see her sister at her door after her sister making it clear she didn't want her in her and her sons life. On top of that she up and disappears and leaved her nephew in her care. Worried about her sister she asked Deputy Dev to track her sister down. This is the second book I have read in this series. Each book can be read as a stand alone novel. So this is great for new readers as they can jump right into this series at any point. I do have to admit that I am a bit bias. This book combines two things that I have a fond place for in my heart...horses and Colorado. Being a Colorado naïve, I am drawn to books that are based in Colorado or authors that were from or live in Colorado. Right away, I was drawn into this book. I just liked Charity, This is the second book I have read in this series. Each book can be read as a stand alone novel. So this is great for new readers as they can jump right into this series at any point. I do have to admit that I am a bit bias. This book combines two things that I have a fond place for in my heart...horses and Colorado. Being a Colorado naïve, I am drawn to books that are based in Colorado or authors that were from or live in Colorado. Right away, I was drawn into this book. I just liked Charity, Dev, and Brodie. If it was not for Brodie, than, Charity would have kind of been of been just another person. Not that her barrel riding skills make her dull but she was more straight and narrow. Brodie pushed her to her limits and to expand her horizon. Speaking of Brodie; I felt bad for him. His mother just leaves him with his Aunt without a goodbye. Finally, there is Dev. He is kind hearted but also made me laugh. For example, when he got to put on his sirens and drive more than twenty five miles an hour to the scene of the "crime" involving Charity and Brodie and a wild night ride excursion. Dev and Charity did not hook up until about the half way point. The love making scenes are brief but hot. This is the first book of the series I have read, and rest assured that it’s definitely a stand alone. Charity Stone has made a name of herself not only as a champion barrel racer, but also as a gal that will handle anyone and anything. Her childhood was tough. One in which she had to take care of herself while her Mom paraded men. Dev Jenkins is the local deputy that has been attracted to her, though from the distance. When Charity’s sister drops her 13 year old son Brodie on her doorstep with a This is the first book of the series I have read, and rest assured that it’s definitely a stand alone. Dev Jenkins is the local deputy that has been attracted to her, though from the distance. When Charity’s sister drops her 13 year old son Brodie on her doorstep with a promise of coming back to get him, Charity is faced with a troubled kid who’s going through the same feelings of abandonment she went through as a kid. When he gets into trouble, Charity goes to Dev for help. While the story is engaging and the characters likable and complex, it’s the underlying story that will touch your hearts. A reminder that children who are neglected and/or abandoned by those who are suppose to care for them, will likely be adults that will carry that same feeling. An endeavor difficult to overcome. In this case finding someone who “gets” you and loves you, makes all the difference. Colorado Cowboy by Sara Richardson is a novel that heats up to a boil and leaves one wishing for me story. The cast of characters tugged at my heart strings all the way. Two women who grew up with a mother that lacked in parental sense. The sisters find themselves in trouble. Both had to grow up fast. One has a tough trust no one act and the other sister lands herself into jail. Charity finds herself facing her past life. All those bad mistakes by her own mom leave her feeling hot with temper. Bu Colorado Cowboy by Sara Richardson is a novel that heats up to a boil and leaves one wishing for me story. The cast of characters tugged at my heart strings all the way. Two women who grew up with a mother that lacked in parental sense. The sisters find themselves in trouble. Both had to grow up fast. One has a tough trust no one act and the other sister lands herself into jail. Charity finds herself facing her past life. All those bad mistakes by her own mom leave her feeling hot with temper. But for good reason. Charity will also experience that power of love, hope, and forgiveness. Until then, she is dealt with a sister who drops off her now, thirteen year old nephew. A boy who said he didn't remember her at all. Immediately my heart broke for all the characters. Charity, her nephew Bodie, and her lover Dev, were the ones that captured my heart and soul. They made me want to keep on reading. I laughed, cried, and cheered for them as their troubles unfolded. Watching them break down and rebuild back up was beautiful. Overall, this was a well-written story. One that motivates and inspires to be the best one can be. I was pulled right into this story. The story has laughs, pain, secrets, and heartbreak. This is Charity and Dev’s story. Charity is used to being in a male dominated world. She is a champion barrel racer, so she is used to cowboys. She does not do relationships. But one cowboy is determined to get her to try and he is just the one to change her mind. She can resist him, right? What happens when she needs his help? Can she get his help but also keep her distance? When her nephew starts really messing with the town, he is going to have to take action is she going to push him away for doing his job? Or finally allow someone to help? Thank you to @readforeverpub and @netgalley for this free ARE in exchange for a fair and honest review! I absolutely adored my first Sara Richardson novel! I have been on a cowboy-romance binge and Colorado Cowboy didn't disappoint. I loved the plot. A barrel racer, Charity, and an officer/cowboy, Dev, who start to develop feelings for each other. There are twists and turns the whole way through which made this even more enjoyable. Charity is a strong headed woman who loves her independence. Her beauty is striking and men take notice, but she is a tough one to crack. No man has been able to find a I absolutely adored my first Sara Richardson novel! I have been on a cowboy-romance binge and Colorado Cowboy didn't disappoint. Charity is a strong headed woman who loves her independence. Her beauty is striking and men take notice, but she is a tough one to crack. No man has been able to find a way to her heart. Dev is a man who sticks to following the rules. He is sweet, kind, and loyal. He also might have a small crush on Charity. I loved getting to see their relationship blossom. The sparks were there whenever they were in each others presence. Overall, I believe this book is a must-read for cowboy romance lovers!! I give Colorado Cowboy 5 stars. It checked off everything I want in a romance and more. Charity Stone has held her own in the rodeo world, she means business and takes no crap from the guys. When she decides to settle in Topaz Falls she catches the eye of officer Dev Jenkins. Charity does not do relationships, but when she unexpectedly has to take care of her nephew she finds that she turns to Dev for help. Dev has liked Charity from the moment she moved to Topaz Falls, he is determined to break down her walls. When she comes to him for help with her nephew he thinks this is the pe Charity Stone has held her own in the rodeo world, she means business and takes no crap from the guys. When she decides to settle in Topaz Falls she catches the eye of officer Dev Jenkins. Charity does not do relationships, but when she unexpectedly has to take care of her nephew she finds that she turns to Dev for help. Dev has liked Charity from the moment she moved to Topaz Falls, he is determined to break down her walls. When she comes to him for help with her nephew he thinks this is the perfect time to make his move. Will Dev be able to win her over, and convince her that he is not just another cowboy? I have completely enjoyed this Rocky Mountain Riders Series this far. The Characters that Ms. Richardson brings us are so real, and she draws you in with each feeling and emotion they share. Charity is a famous barrel racer and she doesn’t take any crap from any guys after the way she grew up figuring if she doesn’t get attached to anyone she can’t be left alone. When Charity’s sister drops in with her son Brodie that Charity hasn’t seen in ten years she is suspicious but she lets her stay the night but when she wakes up her sister is gone. Now she is stuck with a brooding 13 year old boy but Dev the sheriff in town has always had a sweet spot for the fiery barrel racer so he offers Charity is a famous barrel racer and she doesn’t take any crap from any guys after the way she grew up figuring if she doesn’t get attached to anyone she can’t be left alone. When Charity’s sister drops in with her son Brodie that Charity hasn’t seen in ten years she is suspicious but she lets her stay the night but when she wakes up her sister is gone. Now she is stuck with a brooding 13 year old boy but Dev the sheriff in town has always had a sweet spot for the fiery barrel racer so he offers to help. This story is about learning to trust someone and breaking down the barriers you have had for so long. Love Charity’s spirit and Dev’s unwavering support. I wasn't sure how I was going to like this read about a cop and a barrel racer, but I became invested in their story SO FAST!!! They both had some heavy baggage to unpack together. Though it was bumpy for them, I really enjoyed the ride that was this story. You can easily see that they genuinely care about each other as a person from their first interaction. The dynamic with the nephew was a nice addition in my opinion. Then again, I like when there is a kid involved to help move the trust betwe I wasn't sure how I was going to like this read about a cop and a barrel racer, but I became invested in their story SO FAST!!! They both had some heavy baggage to unpack together. Though it was bumpy for them, I really enjoyed the ride that was this story. You can easily see that they genuinely care about each other as a person from their first interaction. Ew. Pretty sure kids still look like kids. How drunk is this guy? I could have told her she'd end up taking care of Bodie. It's not a false accusation if there are pictures of her sister committing a robbery. Yikes, triplets. People have trouble with one baby at a time. Sheesh, Gracie, being a good person is more important than riding lessons. I actually like Charity's mom. It's not Dev's fault that Mel Great opening line. It's not Dev's fault that Melody was an accomplice! I love the family unit they have built. Colorado Cowboy, by Sara Richardson, is the latest in the Topaz Falls series. I have been waiting for Charity and Dev’s story since Richardson introduced Raines’s Renegades and it did not disappoint. Both Charity and Dev have a lot to learn about trusting people and what family looks like; Richardson pays as much attention to the family piece as the romance. Though not officially a second chance romance there are lots of second chance elements. I recommend this book to those that enjoy Kari Lynn Dell, Carolyn Brown, and Karen Rock. This book is part of a series, but can be read as a stand alone book. The characters of Dev, Charity and Bodie took me on a roller coaster as we see how these characters react to situations that are out of their comfort zones! I really enjoyed this story! I will be buying more books by Sara Richardson as I was impressed with her talent! A great weekend read! I received an advance copy from the publisher via NetGalley in exchange for my open, honest review! I really liked this romance. They really got to KNOW each other, and I liked how they worked through their issues and the supporting cast was very good. The pacing was good, and while their were some personal walls needing to come down, I never felt that the conflicts were OTT reactions. Overall, an enjoyable story that kept me reading well past my bedtime. *I received an ARC of this book from NetGalley and this is my voluntary and honest review. Charity, appreciates a good view, “oh.” She startled. He’d caught her looking. “It’s…nice.” Yeah, sure. She was totally checking out the gun and not his body. " Dev doesnt take subtle hints so his wiman just has to make demands, “obviously.” Charity realized she was digging her nails deep into his back. “You need to lose the pants. Now.” I liked this book, I fell in love with Dev. Charity and Dev danced around each other for quite some time until they finally let each other in. Charity has family issues and winds up with custody of her nephew and needs help, and Dev is more than happy to step in. This was a sweet western romance! An easy and heartwarming read with a epilogue that made me smile. Loved Dev and how he was there for Charity and Brodie. Can’t wait for a return trip to Topaz Falls. LOVED IT!! Sara Richardson out did herself with this story. It has the feels. Charity definitely has her guard up until Hot Officer Dev proves himself. The chemistry is hot and the sparks fly. Her Heart of the Roc Contemporary romance author Sara Richardson has been a communications manager, copy writer, magazine editor, and whitewater rafting guide. The day after graduating with a master’s degree in journalism, Sara realized she was too empathetic to be a journalist and starting writing her first novel instead. A lifelong fascination with true love quickly led her to the romance genre.